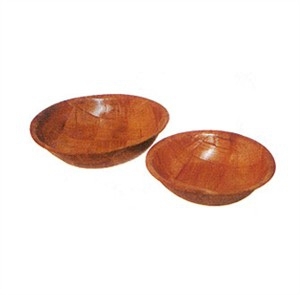 Serve salads, sides or snacks in the Winco WWB-10 Woven Wood Round Salad Bowl 10" These 10" wooden bowls have a protective finish which makes them break-resistant, non-absorbent and dishwasher safe. Due to their strong and sturdy construction, they can be used to serve many types of foods, or even snacks at outdoor or indoor events. With a natural and appealing look, wooden bowls will add warmth to your table setting and enhance the appearance of your wholesome and hearty food.